Gene Flory is known for his attention to detail and great client service. After serving as a U.S. Marine, Gene quickly established himself as skilled woodworker in the home construction industry. To expand industry knowledge early in his career, Gene became a successful sales representative with a leading Lancaster, Pa., building products supplier. After several years of success, Gene decided the time was right to get back to the hands-on side of construction serving home and business owners in the region. Since 1995, R.E Flory has been the "go to" name in custom building and remodeling services in Berks, Lebanon and Lancaster Counties. Today, with decades of knowledge and experience, Gene can provide reliable guidance to help you with any building and remodeling project – from a complete custom home to emergency storm-damage repairs. 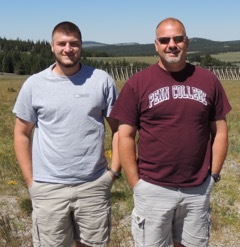 Gene’s older son Nathaniel is currently attending Pennsylvania College of Technology in Williamsport, and is working on his 4-year degree in Residential Construction Management. During summer breaks, Nathaniel works for the business, gaining solid experience in preparation of joining the business full-time upon graduation.